This week I have to say that without a doubt, Bleach 489 was the standout chapter between this and Naruto. Whereas Naruto was firmly rooted in past events, Bleach was very much in the present, as well as setting up something brilliant for the future chapters. 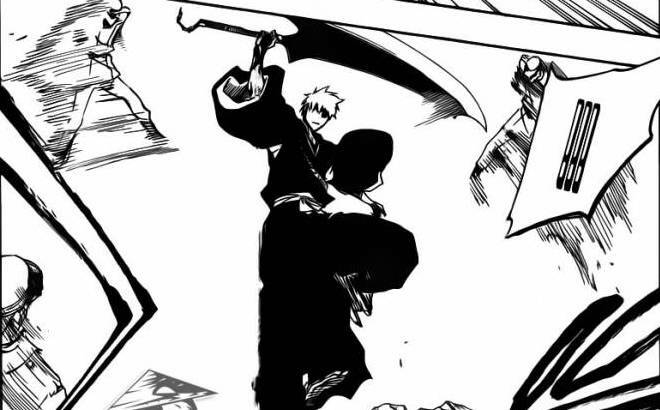 Last week we got to see what looked like the beginning of Ichigo vs Kirge, but Ichigo instead starts off against a few other Quincy instead as you can see in the picture above. It doesn’t take long for Ichigo to realise that the people who before were only known to him as the Vandenreich were in fact Quincy. Kirge even comments on the fact that he invaded without even being 100% sure of who they were, not that it makes a difference to Ichigo as we all know by now. Rather than Ichigo fighting, this chapter was more focused on the strange events that have been taking place in Soul Society, and who’s to blame for it. To begin with we just see Rukia pacing the floor in Soul Society where she is waiting for the captain’s meeting, with Renji telling her to calm down and take it easy, only for Kira to appear and interrupt. He tells them that something is bothering him, and explains how he used to think all the Vandenreich / Quincy stuff was connected with the disappearances from Rukongai, but now he realises that’s not the case. Kira begins to explain his thoughts on the matters, and asks a question as well. When Yachiru answers, it confirms things for him, and he asks Nemu what Mayuri is hiding (having concluded that there was something odd about the way things had been done and investigated by his group). Nemu says Mayuri never told her anything about the disappearances, with Kira saying he will just have to report it to Yamamoto himself. Later in the chapter, we see Yamamoto confront Mayuri about it and asks him what’s going on. Mayuri tells him that it’s true he was behind the disappearances, as he had some Shinigami go in to Rukongai and kill the people to keep the balance between spirits and people even. Yamamoto asks why he didn’t ask for permission, saying that under the current circumstances it would have been approved anyway. Mayuri says that if things had got worse, his unit would have been held responsible for it, hence why he went ahead and did it anyway. Yamamoto responds by saying that if they had reported things sooner, then maybe things wouldn’t have become so serious in the first place. Without hesitation, Mayuri tells Yamamoto he is wrong. He then says how right back when Ishida first invaded Soul Society along with Ichigo etc he warned him of what could one day happen, but that Yamamoto claimed his fears were baseless and denied it. Mayuri then says Yamamoto is the one to blame because he didn’t lill “that man” 1000 years ago. Meanwhile, with Ichigo distracted by his battle with Kirge and the other Quincy, the king declares that now is the perfect chance to invade Soul Society, and so they head off to do just that. But yes, that was the main content of the chapter. As you can tell, things are getting very serious with potential consequences being unthinkable. The dischord in Soul Society just reminded me of something Kubo said in the interview he did shortly before the arc came out, that being that Soul Society would be devastated like never before (or something along those lines). I mean, while I know the Quincy invasion is going to have a huge impact on everything, maybe a part of what will make things so devastating and like nothing they have ever seen before will be that Soul Society will become full of rifts between the Gotei 13. With this chapter we can already see that Mayuri is unhappy with Yamamoto, and Yamamoto doesn’t seem too happy with Mayuri either. Of course we have no idea who “That man” is / was, but he could even come back to play some huge role, whether that be what happened in the past or even if he is still alive and active somehow today. I was expecting this to be an action and battle filled chapter, but instead we were given something that is playing far more with the distrust and psychological aspect of things, and as a fan of that sort of thing then I enjoyed it a lot. Kubo really has done a spectacular job with this arc, and I can’t commend him enough for it. Kubo gets a lot of stick from people for all his trolling and “asspulls” that seemed to be brought up for every arc, but this time I can’t imagine there are too many fans who would criticise what he has done in this war arc. This was a pretty awesome chapter, despite not being what I (and I suspect many others were expecting), and I really can see next week being fantastic, especially if the Quincy do indeed reach Soul Society by then.